From Polynesia comes this new sport that is causing a furor already in half the world. 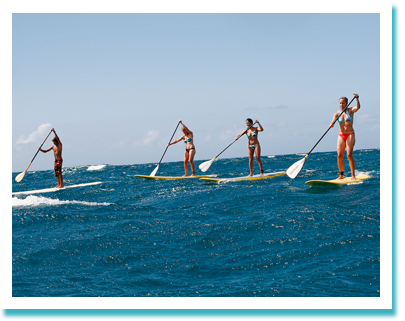 It is the Stand Up Paddle surfing, colloquially known as SUP. Each sport has its moment, and this is certainly the time to SUP, an escape route, a way to escape and feel in complete harmony with our oceans. It is also recognized as one of the exercises more complete that exist to date, aerobic and anaerobic. It work absolutely everything. From the waist up is very similar to the Kayak, you work arms, back, abdominles... and from the waist down... absolutely everything! Since your legs are in constant work looking for balance. This is another of the strong points of the SUP, without just giving you account, you develop balance an outrage! It is also a good exercise for the heart, acquires much Fund. The best thing is that there are conditions that have you're going to enjoy! When the sea is calm, it is ideal to enjoy the feeling be walking over the surface of the sea, explore the coast, and let yourself be amazed by the seabed, and is an amazing viewing angle, all of this at the time you exercise the body you have to go stand. On the other hand, if you get a day with wind and some sea, a traverse downwind (wind) can be something that you don't forget ever, taking advantage of the power of the wind and the sea podr·s scroll faster and travel long distances in a matter of minutes. Finally there that forget that it's surfing... catches a day of waves and will enjoy it to a point that you can not imagine, and is that the SUP grabs up the slightest wave without the least difficulty!